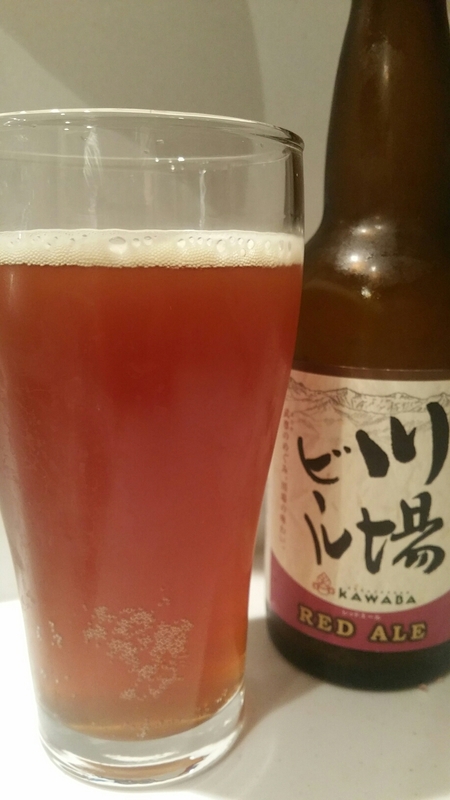 Kawaba Red Ale is a 5% amber ale from Kawaba Beer, based in Gunma prefecture. It is also sold as Kawaba Sunrise Ale though Kawaba Red Ale seems to be the main one in the Kawabe Beer lineup. It’s brewed using German hops and malts in the brewing process and locally sourced water from the Kawaba area, which is predominantly soft water. Kawaba Red Ale can be found in mainly bottles as we’re yet to come across it on tap on our bar travels. This has two different names; Kawaba Sunrise Ale, but Kawaba Red Ale is the main name now. For some reason, Kawaba Red Ale really didn’t want its photo taken. Every photo I took of it, ended up with some funny chill haze, condensation or overexposure. Camera shy perhaps? It’s also one of the very few “regular” beers that has a shelf life of over three months. The best before date on the side was for April 2016 and mentioned that it was best drunk within one year of bottling. It poured out a light reddish-brown colour with a minimal amount of head on top, barely even a finger’s worth and that included some agitation of the glass to get some life into it. There aroma was mostly of caramel without much hops on the nose so Kawaba Red Ale definitely leaned towards the sweeter side of amber ales. However, and there is a big however, Kawaba Red Ale didn’t have the body to sustain the malt. It was far too watery for my liking and as a result, the caramel flavour was too dilute nor did it linger. On top of that, it finished off astringent and sour. It might be ok to list your beer with a one-year shelf life, but it better hold up to it. Kawaba Red Ale isn’t an amber ale I would recommend to anyone. Maybe it’s better on tap but until then, leave it alone.